Come on in and have seat! This is a very gothic look. I wanted to use red, black and gold. 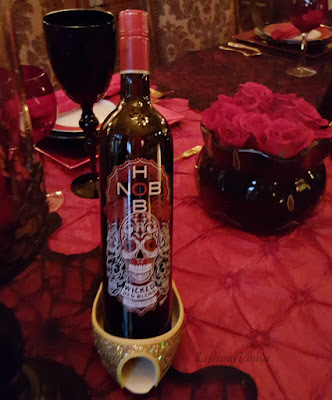 Red roses for a centerpiece and red and black wine bottles sitting in my gold high heel shoes. I draped the chandelier with spooky black fabric. 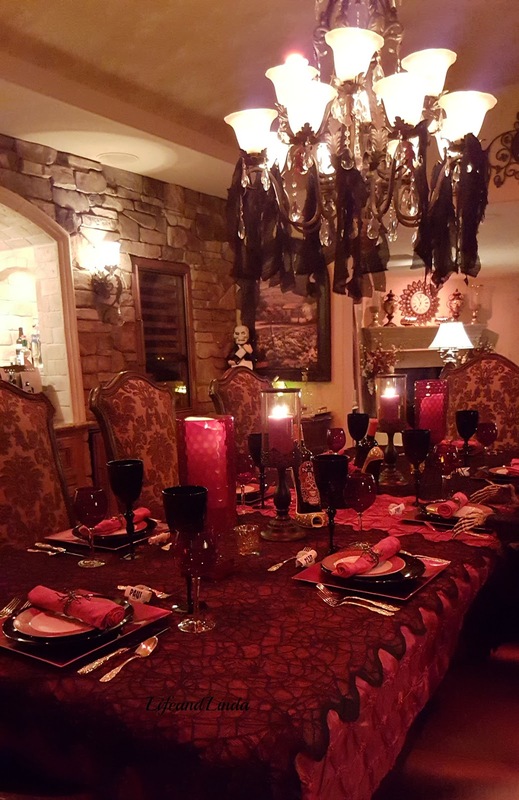 The dining room has an eerie red glow, made by the Phillips Hue bulbs. We can change the colors by using the Hue app on our tablets. I made a setting for Judy, one of our neighbors who wasn't in town to attend this dinner party. Her husband and friends got a kick out of her. Sorry Judy, no pun intended. You were missed! 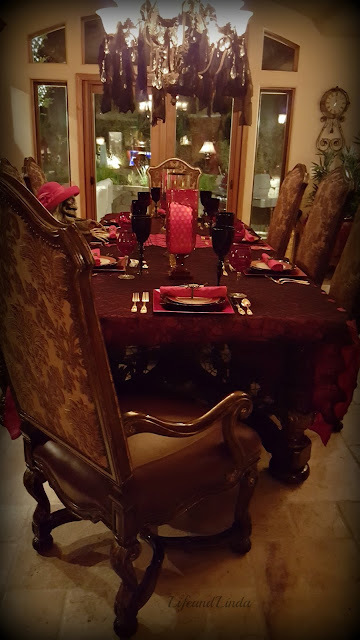 I layered the table with a red tablecloth and topped it over with a black spider web topper. 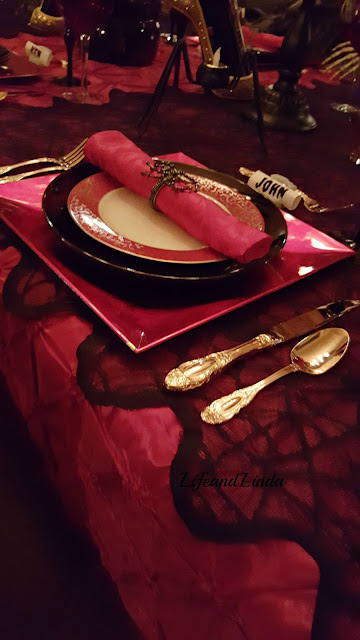 Gold flatware with red square chargers, black dinner plates and my Mikasa red parchment salad plates. 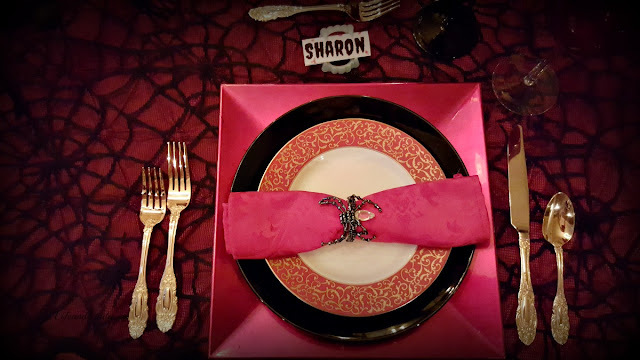 I also used red napkins with a spider napkin ring. For fun, I used the fake vampire teeth. I glued them at the edges so they were closed more and I made the place cards on my pc. 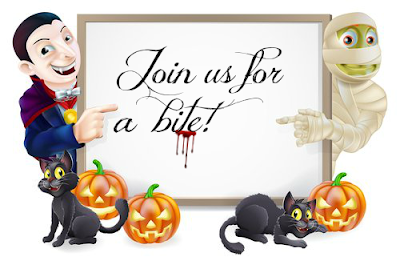 The vampire fangs placecard holders are inspired! Thank you Debra. it was a blast to set this table up. Oh how fun! I've never thought of the high heel idea. Very clever! That is so darn cute! That skeleton with the hat on....sitting at the table is hysterical! How spooky and fun Linda! I haven't heard of the Phillips hue bulbs, wow! There is an app for everything! Love Judy's fill in, very hilarious!!! Love it! Gorgeous. I am glad Judy had a stand-in. 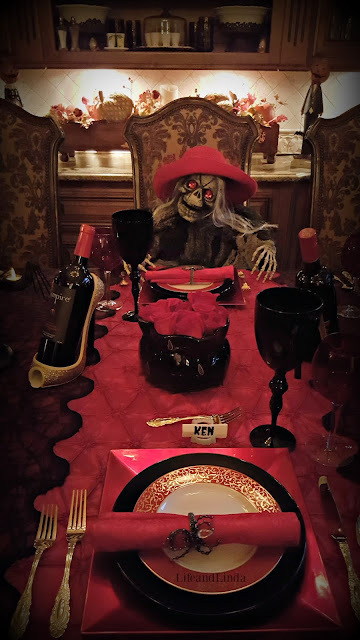 hahahaaaa...what an awesome Halloween table my friend! 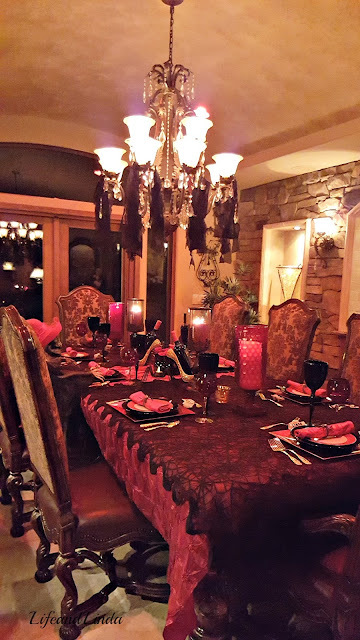 I would love to be sitting at this table enjoying my Halloween day on style and with Judy, lol! Love the red and black idea, you are so talented pretty Linda, and all the elements in your table are terrific, specially the vampire fangs place card holders! 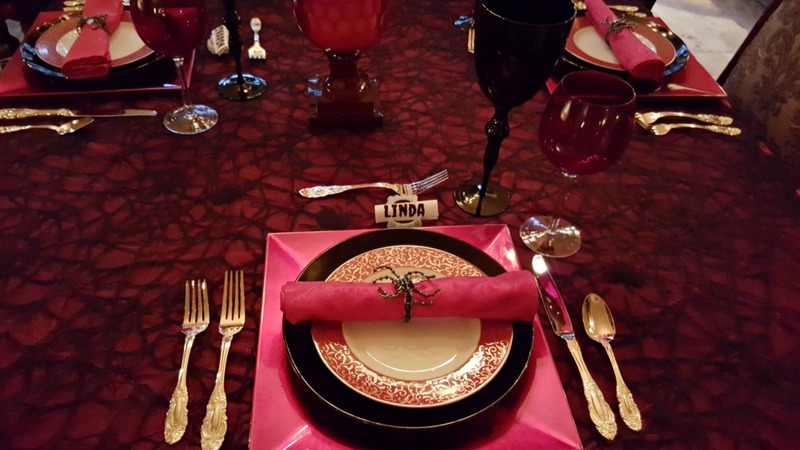 You certainly have a way with a tablescape, Linda. You've made it fun yet you always manage to keep it classy. I love it! Elegant and fun.......you are the master!!! Love it! All of the details are so perfect! Creepy, but fun! You could bring this one to the party over at Celebrate it Sunday too! Pinning and sharing at FB and Twitter. Maybe someone needs some last minute inspiration for this weekend. 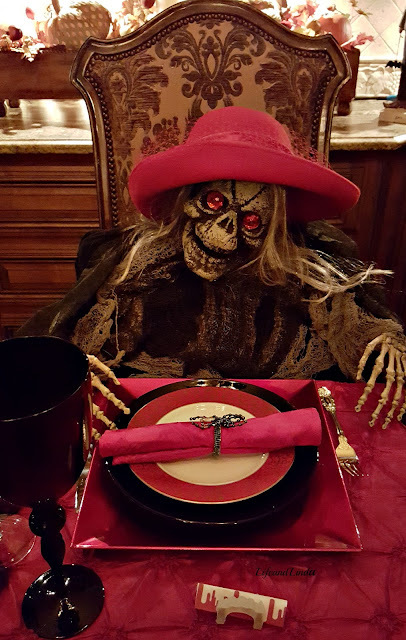 Your table is just too fun for Halloween, Linda! 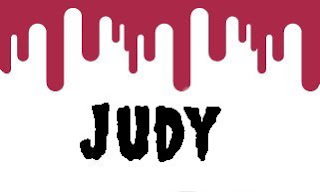 I'm sure judy was missed, but what a substitute you provided!! The place cards are soooo clever and so easy to do. Thanks for your inspirational tablescape. This is so fun! Cleverly thought out, and poor Judy does look like she could use a good bloody steak or something. I have no idea about what you are doing with the lights, but it certainly is theatrical! Oh, Linda! You're amazing, girl! This table is so cute and a bit scary. Now Judy is quite the hostess too! Fun times! I love Judy's stand in. :) You always do such an incredible tablescape and I'm sure you had a great evening. Oh, this table setting is wonderful, Linda. It's so festive, and I love the red, black, and gold colors. Such a fun bottle of wine. The girls would love that. You sure do know how to decorate for each holiday. Hi Linda, this is so much fun!! You create the best themed table settings and this is no exception. Love it. Dinner at your house is an adventure!! Thanks for always inspiring. Ooh I love this! Love the "blood" red feeling from the tablecloth and the spiderweb overlay. The chandi looks cute too! How cute having the skeleton sitting in for Judy! Looks like you had fun with this one! How clever to replace Judy, looks like you all had fun. LOL, Judy definitely needs some meat on her bones! Such an inspired table, Linda. Your party must have been a blast. Everything from the spiderweb tablecloth to the skull and cross bones on the wine bottles is just fantastic!